Donald Berwick met with senior citizens in Harvard Yard. Massachusetts voters, it seems, are partial to outsiders. Elizabeth Warren was a law professor and consumer advocate before she won election to the US Senate. And Deval Patrick was a little-known lawyer when he launched his first campaign for governor. The most obvious Democratic heir to the brand, this year, is gubernatorial hopeful Donald Berwick. He worked briefly for Obama administration, but unlike his major rivals for the job, he is no creature of Beacon Hill. And he has pitched himself as a Warren-like figure in recent months – a fiery progressive propelled by a grassroots energy. Yet the newest newcomer is struggling to get traction. He’s polling at just 5 percent, 15 points behind Treasurer Steve Grossman and a full 40 points behind Attorney General Martha Coakley, his two rivals on the Sept. 9 primary ballot. Berwick is not the only outsider to stumble this year; two other fresh faces, homeland security expert Juliette Kayyem and biopharmaceutical executive Joseph Avellone, didn’t even qualify for the Democratic gubernatorial primary ballot. Their travails have sparked a debate among political operatives and observers about why some candidates are able to grab the most coveted label in Massachusetts politics and others are not. And the evidence, they say, points to a volatile stew of factors: race, gender, political party and timing. There is no official start to the Bay State’s Age of the Outsider. But Philip W. Johnston, a former chairman of the state Democratic Party, says it goes back decades. “It’s very clear to me that this outsider issue has been in play here since 1960,” he said. That was the year John Volpe, a Republican businessman who served in the Eisenhower administration, beat long-time-state-legislator-turned-Secretary of State Joseph D. Ward for the governor’s chair. The dominant figure of the 1970s and 1980s was Governor Michael Dukakis. He served as a state representative before he took the corner office, but was widely viewed as a liberal reformer — “an outsider from within,” in the words of Democratic political strategist John Walsh. His successor, Republican William Weld, broke 16 years of Democratic rule by campaigning against the culture of Beacon Hill. Weld passed off power to Republicans Paul Cellucci and Jane Swift before the next two outsiders — Republican businessman Mitt Romney, a Mormon in a heavily Catholic state, and Democrat Patrick, the state’s first black governor — took their turns. The lessons of the gubernatorial succession, observers say, are many. First: a Republican, just by dint of party, can claim outsider status in a deep-blue state. Hence this year’s Republican gubernatorial frontrunner Charlie Baker, a veteran of the Weld and Cellucci administrations, is putting Beacon Hill reform near the center of his campaign. In media appearances, press releases and fundraising pitches, Baker pledges to clean up the sort of patronage laid bare by the recent corruption trial of John J. O’Brien, former state probation commissioner. On the Democratic side, figures like Warren (who grew up in Oklahoma) and Patrick (a Chicago native) have demonstrated the appeal of the literal outsider. But Democratic political consultant Lou DiNatale said race and gender have also played a critical role. “The outsider in Democratic politics — it’s more about identity politics,” he said. That makes it hard for a white male like Berwick to catch fire in a Democratic primary, DiNatale said, and it allows Coakley — one of the best-known politicians in the state — to put some distance between herself and the Beacon Hill set that voters love to loathe. Timing, observers say, can also play a role. In 2010, Republican Scott Brown rode a powerful Tea Party surge to his stunning US Senate victory. And two years later, Warren unseated him with an equally well-timed critique of Wall Street. It is not clear that Berwick, who has pushed for single-payer health care and an end to homelessness, has found the same sort of zeitgeist issue. He points out that he is the only candidate in the Democratic primary to favor a repeal of the state’s casino law, which will be on the ballot in November. But that vote will come two months after the Democratic primary. And the latest Globe poll shows likely Democratic primary voters favor keeping the law in place by a margin of 49 to 40 percent (the survey has a margin of error of 5.1 percent). “It’s not clear [opposition is] going to coalesce early enough on, in a strong enough way, to give Don Berwick what he needs,” said Steve Koczela, president of the MassINC Polling Group, which found Democrats supporting casinos in an early July survey of its own. Berwick, though, is pressing on. 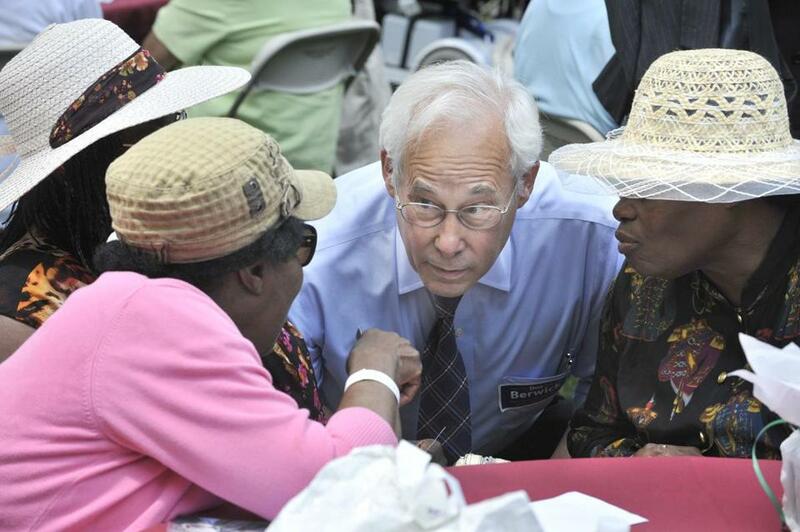 On Wednesday afternoon, he was one of several candidates for statewide and local office making the rounds at the annual summer picnic Harvard University hosts for Cambridge senior citizens. As the mostly liberal crowd noshed on roasted chicken on a bed of mozzarella, tomatoes, arugula and penne pasta, Berwick made the case against casinos and touted his plan to end chronic homelessness. Cecelyn Morris-Bent, 71, a retired medical records assistant, was impressed. “I wish him good luck,” she said. Leah Dickstein, 79, a retired professor of psychiatry, said she is backing Berwick though. She likes his focus on health care. She says he seems honest. And she likes his outsider appeal. “I’ve been an outsider all my life,” she said.